ASTER is pleased to announce the release of our first CD! 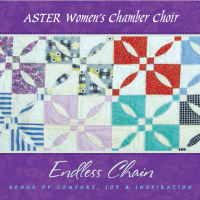 Endless Chain contains sixteen songs highlighting the past eight years of ASTER Women’s Chamber Choir performances. Endless Chain is a collection of the very best of the melting pot that is America. Selections include lullabies from Scotland and Wales, folksongs from Ireland, Norway and Scotland, hymns from many traditions, settings of Lynn-Craig’s Old Wives’ Tales and two of ASTER’s all-time favorites: Endless Chain, Pete Sutherland’s tribute to quilters and O Unico Amore, a piece by Boulder composer Kathleen Fagre commissioned by ASTER to honor Mother Cabrini. CDs are available for $10.00 (plus $5.00 S&H).